The disappointing second half lets it down, but even at best, Broken Age is far from the genres greats. I say ‘Part 1’ and ‘Part 2’, but it’s not quite that simple. Broken Age wants to be one adventure game, simply rolling along from start to finish as if the last year never happened. In practice, being split into episodes hasn’t been to its favour, both in terms of how over-familiar its world feels despite our limited exposure to it, and how bloated this new instalment feels—like a third of the game has been forcibly over-inflated to be a full half to justify the time taken, rather than simply presented as originally intended. That may or may not be true, and if it is, I do understand. In another world, I might be whining “Wait, this is it?” after zipping through. It’s still not right though. The first part of Broken Age was in every way a comfortable rather than revolutionary experience, but an interesting one that offered two intriguing, isolated character stories—Vella, a young woman who decides she’d rather not be fed to local Cthuloid horror Mog Chothra, and Shay, a young man on a nurserypunk spaceship looking for a real adventure. Despite their simplicity, there was a cleverness in their design—little touches to watch out for, and a shared theme of growing up and finding your own path. All of that gets chucked aside in the second chapter, which answers the big questions early on and then has little to replace them except shopping lists for both characters. The adventure does hold on to both its humour and charm throughout at least; a disarmingly effortless flavour full of imaginative concepts, amusing characters and great lines. The characters rarely become more than puzzle pieces, but are still well worth chatting to and showing off inventory items with to squeeze out all their jokes—particular highlights being an easily offended tree, both characters’ families, and the pair of druids desperately trying to find something worth worshipping. They’ve tried a dead god, now they’re trying a tree, and if that doesn’t work, they’re out of ideas! The resolution of their story is an adorable moment too. As with so much of the game though, all this is more effective early on, where the whimsy is playing off the dark core plot—that Vella’s world is one where maidens are cheerfully sacrificed with fetishistic glee and that Shay is practically tortured with his boring artificial life. In the second half, not only do the big reveals make the mysterious quite mundane (staggeringly so, compared to the inventiveness of the first half, with Shay's not making a whole lot of sense and Vella's ending up exactly what I hoped it wouldn't be), both characters largely just let what happens wash over them. The sense of adventure is then even further ripped from their tales by the majority of the time being spent just retreading the exact same locations—some redecorated a bit, but not by much at all. Without both the intriguing mood to pull the story and their original freshness, it’s much harder to ignore the problems under the surface. Puzzles in particular aren’t a high point in the first half, but are largely forgettable. The later ones are markedly worse. Far too many mistake time-wasting for difficulty, with endless traipsing back and forth, dealing with needlessly obstructive characters or mechanics (particularly in the final puzzle, which is tooth-grinding in its over-deliberate fussiness), and developing an obsession with rewiring robots through the most tedious trial and error. We do finally get some where the two worlds interconnect, but only to a point. Rather than giving Shay and Vella a walkie-talkie or something with which they might actually spark the relationship the game somewhat casually assumes they have despite them barely having met, it also opts for a real bugbear of mine—characters solving puzzles by using information they couldn’t actually know, like Vella being asked the name of Shay’s favourite toy. It just hammers home that while much of Broken Age is fun, it’s not a particularly great capital-a Adventure. 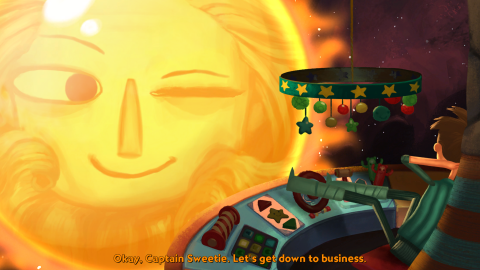 While much of Broken Age is fun, it’s not a particularly great capital-a Adventure. Seen in its entirety though, that’s not necessarily the dire problem it might sound. The bulk is still amusing, charming and enjoyable, and the faults in this second half would be much less notable as part of a whole—in much the same way that nobody really brings up how bad much of the second half of Grim Fandango and Monkey Island 2 were. (And yes, yes they were). Ultimately, it’s a game that cries out for a Director’s Cut, to be a comfortable six or so hours instead of a forced eight-to-ten. As a nostalgia trip, a casual adventure, and a world to explore, it’s pleasant and very pretty company. It’s no modern classic though, so enjoy the ride while it lasts.